Yesterday Facebook released some interesting statistics about the growth of Facebook users world-wide and it looks like Facebook is on the over-drive, especially in India. Facebook now has over 675 Million users world-wide growing an impressive 45% since April last year. America has the largest user base with 155 million users with a growth rate of healthy 23.6% followed by Indonesia (36.4 Million) & United Kingdom (29.9 Million). By end of April 2011, India had 24.9 million Facebook users – So the figure of 25 Million, which was announced at Ad:Tech looks to be absolutely correct! 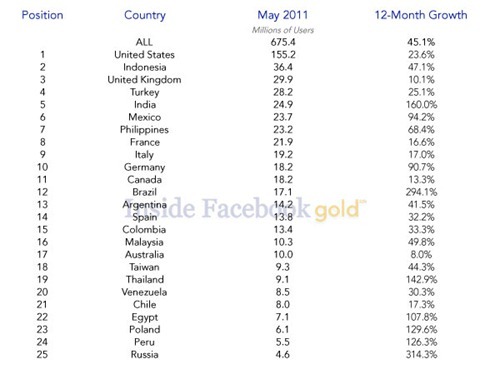 With that number India is now 5th overall in the “Highest Facebook Users” Country list. The FB growth in India has been quite impressive, logging 160% growth since last year. India, in terms of numbers, is now adding maximum Facebook users month-on-month. 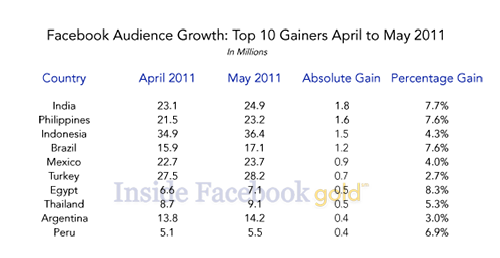 In April alone, India added 1.8 Million new Facebook users logging monthly growth rate of 7.7%. If this growth rate continues, Indian Facebook users should double to over 50 million users in next 12 months or so. And, given the fact that now India has over 100 million Internet users (including mobile internet users), the growth rate should only increase! 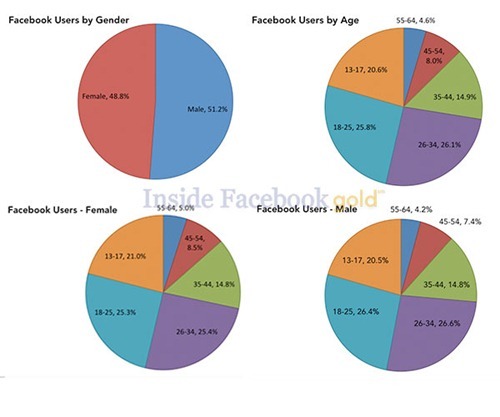 On Global level, Male and Female Facebook usage is evenly divided, with males having slightly higher percentage. In terms of age – users aged between 26 to 34 & 18 to 25 years old form over 50 percent of all Facebook users. So, here is a question – When will Facebook reach 1 Billion users ? Role and Relevance of Marketing in Small Business and Enterprise Development! Is the Facebook story over? 24.9 million indian fb users…………….